A cool new Bayesian methodto separate the “species” part of decomposability from the climate and methods effects. 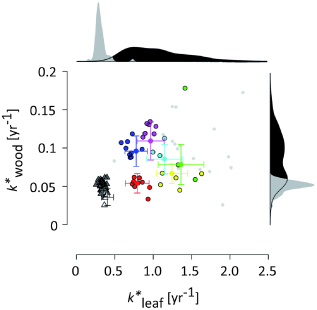 Turns out that, among species, leaf decomposability is weakly but positively correlated with wood decomposability. This is mostly driven by gynomsperms–very, very recalcitrant leaves and wood and the black triangles in the plot above–versus angiosperms. Both leaves and wood are relatively decomposable within angiosperms.